The early years of this Christian territory are shrouded in obscurity due to the lack of detail provided by the sources, which answer very few of the questions arising about the first years of the Kingdom of Asturias and its struggle for survival. Following the conquest of the Iberian Peninsula by Arab forces in 711, localized centres of resistance began to emerge in the Cantabrian region and around the figure of Pelayo, a Visigoth noble. From the shelter of the mountain of Auseba, Pelayo led attacks on the Arab troops, thus initiating Christian resistance. 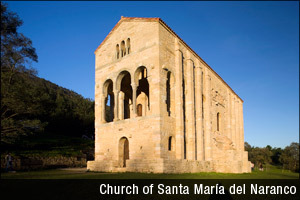 However, it was Alfonso I (737-757), son-in-law of Pelayo, who in his attempt to organize the territories, founded the monarchy as such and extended the Kingdom to the Cantabrian Mountain Range. Oviedo was established as the capital in the times of Alfonso II (791-842), and it was during this period that the Holy Sepulchre was discovered. In 856, Ordoño I resettled and fortified León and Astorga, whilst Alfonso III (866-910) pushed the kingdom’s borders as far as the Duero River, resettling Zamora, and his is considered one of the greatest reigns of the Astur dynasty. With the border established at the Duero River, García I (910-914) decided to move the capital closer to the frontier, giving rise in 910 to the Kingdom of León. Garcia I conquered the most eastern stretch of the Duero and resettled the towns of Gormaz, Berlanga del Duero and San Esteban de Gormaz. Following his death, he was succeeded by his brother, Ordoño II (914-924), who led a series of reasonably successful campaigns against the Muslims. 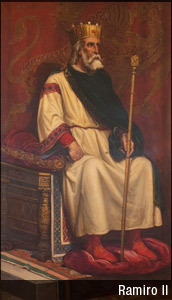 On his death, Ordoño II was succeeded by Fruela II, who reigned for a year before his death left the Kingdom at war between his sons and those of Ordoño. In 931, Ramiro II (931/932-951) acceded to the throne, and was without doubt one of the most notable rulers of the Kingdom of León. Attributed with a war-like spirit, Ramiro II responded to a plea for assistance from the Castilian Count, Fernán González, and succeeded in pacifying the eastern border along the Duero River. When Abd-ar-Rahman III attacked Castile in 934, devastating Burgos and the Monastery of Cardeña, Ramiro II again entered into battle and defeated the Arab forces. He secured the surrender of the Emir of Zaragoza and defeated Abd-ar-Rahman III again at Simancas and Alhandega in 939, said victory enabling the resettlement of Salamanca, Ledesma, Ribera, Abadenga and other important sites along the Tormes River. As regards internal politics, he pacified the rebellious county of Castile. The death of Ramiro II inaugurated a new period of disturbance and confusion, which almost brought about the dissolution of the Kingdom. 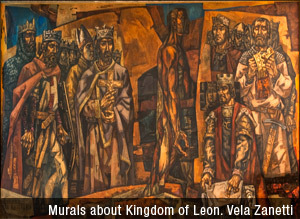 Internal disorder, civil wars, Norman attacks, the incursions of Almanzor and incitement led by the Crown of Navarra all provoked a context of chaos which pushed the Kingdom of León to its limit. Peace slowly returned to the Kingdom with the succession to the throne of Alfonso V (999-1028), and above all, with the death of Almanzor in 1002. It was during the reign of Alfonso V that the Law of León (the Fuero de León ) was enacted, in 1017, laying down regulations concerning daily life in the city. His successor, Bermudo III (1028-1037), was obliged to confront the expansionist tendencies of the Crown of Navarra, which was at the peak of its power, with the resulting loss of the County of Castile and the death of the monarch in the Battle of Tamarón in 1037, whilst he was attempting to recover the said territory. The death of Bermudo marked the end of the Astur dynasty, which had been characterized by a plethora of internal conflicts, rebellions, power struggles, and predominance over all other Christian states in the Iberian Peninsula. As one chapter closed, another opened, in which León would take its place among the principle kingdoms of Europe. The House of Navarra arrived in the shape of Fernando I, King of León from 1037 to 1065, and his successor, Alfonso VI (1065-1109), and implied the territorial consolidation of the Kingdom. The border was pushed forward from the Duero to the Tagus River with the fall of Toledo in 1085, one of the bastions of Muslim territory. The grandson of Alfonso VI, Alfonso VII (1126-1157), would proclaim himself Emperor of all Spain, as recounted in the Chronicle of Alfonso VII the Emperor (Chronica Aldefonsi Imperatoris). Archbishops, nobles, the counts of Barcelona, Tolosa, and Gascony, together with other counts and the Cathars, all attended the coronation. The death of Alfonso VII marked the end of Imperial pretensions and the territory was once again divided between the Kingdoms of León and Castile. With the reigns of Fernando II (1157-1188) and Alfonso IX (1188-1230), the Kingdom of León extended as far as Extremadura. Meanwhile, in Castile, Sancho III (1157-1158) and Alfonso VIII (1158-1214) followed similar expansionist policies in Castile-La Mancha. Alfonso was victorious at the Battle of Navas de Toledo in 1212, marking the beginning of the end for the Muslim world in the Iberian Peninsula. On the death of Alfonso IX in 1230, the two kingdoms were under the rule of Fernando III. By the reign of Alfonso X (1252-1284), only the Kingdom of Granada remained in the hands of the Muslims, enduring until 1492 when the Catholic Kings completed their conquest of Muslim-held territories.